MERSON, Billy (William Henry Thompson), actor and comic vocalist; b.Nottingham, 29 March 1881; first appeared on the variety stage at Birmingham, 1900; for some years toured the provinces as an acrobat and clown, under the name of Ping-Pong; first appeared in London at the old Middlesex Music Hall, 1905; appeared in 1909 at the Oxford; was engaged for some time at the Hippodrome in the revue “Hullo, Tango!” 1913; at the London Opera House, July 1916, appeared in “Look Who’s Here”; at the Palace, Dec. 1918, appeared in “Hullo! America”; May 1920, in “The Whirligig”; at the Lyric, May 1922, played Matthew Platt in “Whirled into Happiness”; at the London Hippodrome, Mar. 1923, appeared in “Brighter London”; at the Palladium, Mar. 1924, in “The Whirl of the World”; at the Olympia, Liverpool, Dec. 1924, Puss in “Puss in Boots”; at Drury Lane, Mar. 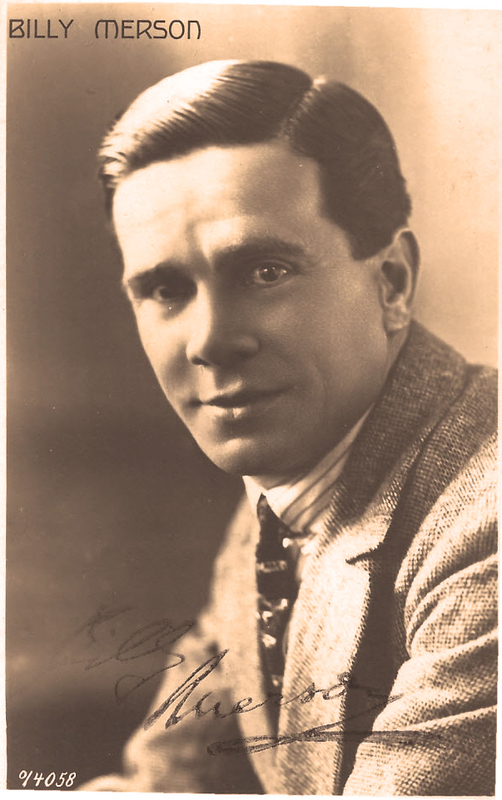 1925, played Hard-Boiled Herman in “Rose Marie”; Palladium, Feb. 1926, played in “Palladium Pleasures”; entered on the management of the Shaftesbury Theatre, Nov. 1926, and produced “My Son John” in which he played Benjamin Littlewood; London Hippodrome, July 1927, appeared in “Shake Your Feet”; Vaudeville, Jan. 1928, played Basil in “Lord Babs”; Wimbledon, Sept. 1928, and Shaftesbury, Dec. 1928, The Lad in a play of that name; toured 1929, as Gene Curtalli in “Playmates”; 1930 in variety theatres; 1931, toured in “Whirled into Happiness” and “Happy Snaps”; 1932, toured in “Meet Mr. Merson”; at the Alhambra, Aug. 1932, played in “Over the Page”; Alexandra, Birmingham, Dec. 1933, appeared in “The Babes in the Wood”; toured, Oct. 1936, as Josiah Clutterbuck in “The Cinema Star”; Garrick, Southport, Dec. 1937, played Buttons in “Cinderella”; toured, 1939, as Hard-Boiled Herman in “Rose Marie”; Comedy, Jan. 1941, played Hubert Briggs in “The Blue Goose”; among his popular songs may be mentioned “I’m Setting the Village on Fire”; “I’m Going Away”; “The Spaniard that Blighted my Life”; “The Gay Cavalier,” etc. ; has appeared in films, in “The Show Goes On,” “Scruffy,” etc. Billy Merson’s last entry in ‘Who’s Who in the Theatre’ (10th Edition 1947). He died on 25th June 1947. 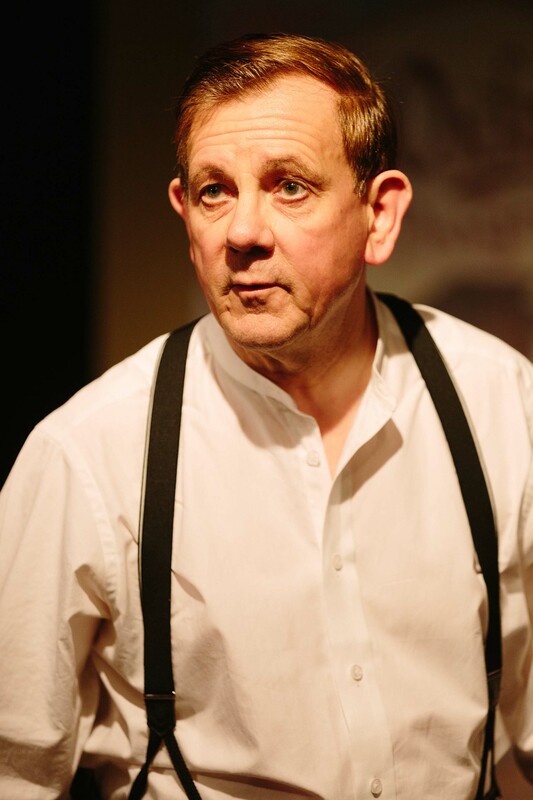 Performances include Alan Turing in Breaking the Code, Henry Carr in Travesties, Noel Coward in Noel & Gertie, Thomas Becket in Murder in the Cathedral and, most recently, Richard III. He has also directed The Only Way, Billy Liar, Crime & Punishment, Polly Honeycombe and The Thrill of Love. Under his QL Productions company, he directed and toured his play Boys Ellman and played George Orwell in Sally Jay’s Tea & Tripe. In his one man show – If I Catch Alphonso, Tonight! – he plays the music hall star, Billy Merson, and is accompanied by pianist Roger Roser. The production is on tour during 2018 and 2019. A native of Lewes Sussex, Roger enjoyed his early education at schools in South Malling and Ringmer. He went on to study music at Dartington College of Arts and Trinity College London. Prior to retirement, he taught at St Mary’s Hall School in Brighton for 27 years. He has always enjoyed playing unusual and long forgotten popular tunes and working with Miles on the songs of Billy Merson has given him the opportunity to do just that!